Of course as the say saying goes, "An Ounce of Prevention is better than a Pound of Cure", so the best solution of all is to pay attention to your pets and keep them away from your futon until it has been around your place long enough to have your personal scent. Perhaps also let your pet on it while you're there watching so they can get used to it. As pet accidents typically occur within the first few days, we believe this happens because your pet is experiencing something new in your place and is "marking" it to assert their territory or ownership of it. Babies, of course are a separate issue altogether, and if you wish to have your baby or toddler sleeping on your futon, it is recommended to find a plastic/vinyl sheet designed to prevent urine getting to the mattress. These are common and available online or in department stores. They may fit a little loose, but better than nothing. The cotton covers can be tossed in the automatic washer/dryer, no problem. However, there are many enzymatic pet urine stain/oder removers on the market (such as Oder X-It) that you can get (you'll need this for the futon), that you can soak the cover in first before washing. A baking soda/hydrogen peroxide mix solution can work too. There are also some other recipes for natural solutions online to remove urine smell as well. There are 3 key points for protecting your futon in the cleaning process. 2) IMPORTANT: Do not, wring, twist or use strong agitation. This can tear the inner cotton and pull it from the quilting stitches anchors that hold it in place which will make it lumpy. 3) IMPORTANT: The futon needs to be absolutely dry through-and-through before using it again or storing it. Unfortunately this could take several weeks of hanging. So the least amount of water used while cleaning it the better. This is by far the most preferred way to clean your futon and remove urine smell. Here you would be using a wet cloth to wet the futon in just the location affected. (This is how we would do it in Japan at home, however we do have specific futon cleaning services here.) Of course the issue at this point is making sure you neutralize all the urine enzymes in the futon to remove urine smell and then rinsing out any cleaning solutions used. Obviously this depends upon how big the pet is and how much of the futon was affected. Not always easy to know. We almost hesitate to recommend this as this is very extreme. 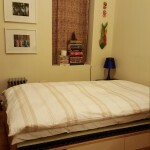 It really should only be used if you feel that it is the only alternative to throwing your futon away. Fill a tub with water (follow instructions on pet urine remover for temperature, though we've heard hot water can set the stain/oder), add the oder remover and then simply soak the area of the futon that is affected, for as long as the instructions say. Note: At this point the futon may feel lumpy. Please don't panic. Once it is thoroughly dry it should be okay. Very carefully, gently press as much water as you can out and let your futon hang to dry. As I said before, this will likely take weeks. Note: You can try using one of those large commercial dryers to remove some of the water, but make sure it isn't too hot. The danger here, once again, is tearing the cotton from it's anchors which will cause it to be lumpy, however this will speed up the drying time once you hang it. Another alternative is to speak with your local dry cleaner and see if the have a process to clean it without immersing it in water. 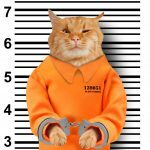 This entry was posted in futon, futon care, real Japanese futon, shikibuton and tagged cat pee removal, urine scent removal, futon care, futon on September 30, 2018 by Hase. Trouble Finding Traditional Japanese Futon? Finding Traditional Japanese Futon in Your Home Country. 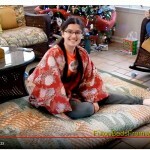 Having trouble finding traditional Japanese futon? One common theme I hear from my customers is that they had lived in or visited Japan and they've found it impossible finding traditional Japanese futon in their home country like the one they had slept on in Japan. That is . . . until they finally found FutonBedsFromJapan.com. As we're fast approaching our first year in business (the website was actually finished (mostly!) last February (2015), but it takes some time for Google to do it's magical ranking process so that people can actually find our website—Something we're still working feverishly on! ), so I'm calling our first order as (roughly) the first day in business (June, 2015), we've now created the place to go to get the REAL thing: Authentic, hand-made Japanese futon made in and shipped from Japan. This entry was posted in shikibuton, testimonials, Traditional Japanese Futon and tagged traditional-japanese-futon on March 31, 2016 by Y Hasegawa. This entry was posted in authentic-japanese-futon-review, shikibuton, testimonials on February 11, 2016 by Y Hasegawa.